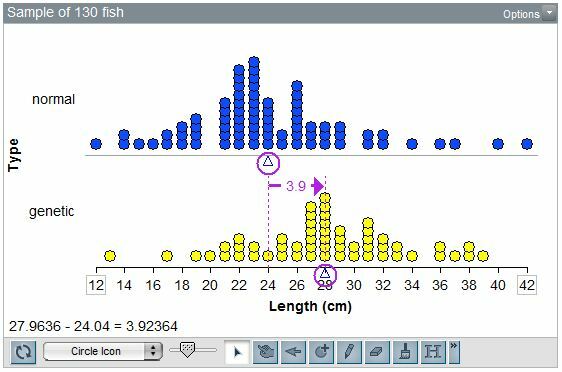 Try these activities to engage your students in data analysis and modeling in a fun and dynamic way. These concepts are fundamental and pervasive in the Common Core State Standards middle school math standards - and interpreting quantitative representations are in the English Language Arts standards too! Every activity comes with a student worksheet and detailed teacher notes, including Common Core State Standards addressed. Students analyze data collected from dropping two pieces of paper, one heavy and one light, onto a target and recording how far they land from the target. Once data are collected, students analyze their group's results, as well as their overall performance compared with that of other groups. Students compare backpack weights for students in different grades and compare backpack weights for boys and girls. They describe the data and use centers, such as means or center clumps. Students also explore different ways of separating, ordering, and stacking data to create a variety of graphical representations, observing how different plots highlight different aspects of the data. Students identify and describe important features of a set of data, specifically identifying which data values meet or surpass a given standard. Students learn to recognize a trend in a time-series graph and use that trend to make predictions. Specifically, students explore how the gold-medal times for an Olympic event have decreased over time. Students expand their ability to recognize trends in time-series graphs, and compare the time-series graphs of two different groups. Specifically, students will compare the trends of gold-medal times for men and for women in the same event. Students take samples from a mixer whose contents are unknown and use this data to determine the location of the center of the hidden distribution. Students look at the shapes of data and learn to sketch distributions by quickly identifying prominent features. Students look at plots of different attributes that demonstrate differently shaped distributions. Students then are asked to sketch distributions and match their partners' sketches to the distribution that was displayed. Students create their own data factories that build objects with varying characteristics. To improve their factory, students consider how values of an attribute are distributed in the real world. Students play the role of a fish farmer trying to determine whether the genetically engineered fish from a new supplier grow to be longer than the fish he usually farms. They determine whether their results are valid or just occurred by chance, eventually comparing the conclusions they drew from the sample data with measures from the entire group of fish. Students explore adding or subtracting a constant as a way to create a group difference, and explore three contexts that can be modeled using this additive-shift metaphor. Students analyze data to determine when a break-in occurred at a yo-yo factory, and then evaluate how close they came to the correct time.